Sm. 8vo., Tenth Edition, on India Paper, with 38 folding coloured maps, 11 full-page maps and plans (a number coloured), numerous illustrations, plans and tables (several full-page) in the text, and a very large folding coloured map mounted on cloth in pocket at rear, some mild offsetting to blank preliminaries, endpapers very lightly age-soiled; handsomely bound in full crushed red morocco BY HATCHARDS, upper board lettered in gilt, back with five shaped raised bands, second compartment lettered in gilt, all edges gilt, wide gilt doublures elaborately tooled in gilt with a floral border enclosing multiple frames, laid paper endpapers, red, yellow and green silk head- and tail-bands, red buckram pocket, a splendid and ornate copy ideal as a gift or for presentation. THE BINDING IS SIGNED ON FRONT PASTE-DOWN. IT WAS COMMISSIONED BY GUY WESTMACOTT WHOSE NAME IS LETTERED IN GILT ON FRONT BOARD (this could well be Guy Randolph Westmacott of the Grenadier Guards). 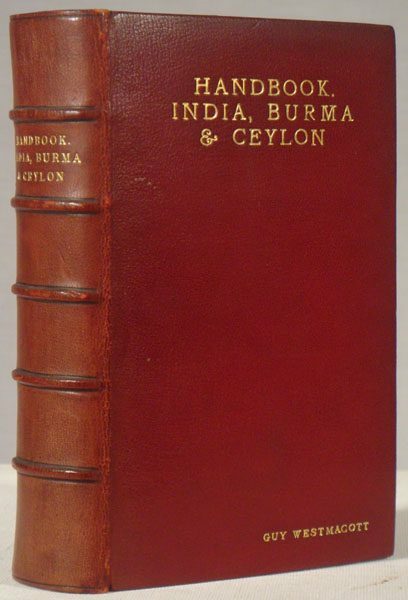 A SPLENDID AND UNIQUE COPY OF THE ONE OF THE BEST EDITIONS OF THE FINEST TRAVELLER'S GUIDE TO INDIA AND SURROUNDING REGION. Very scarce in any condition.